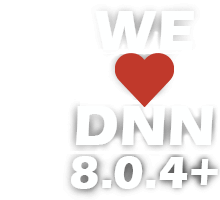 I'm sure you all noticed that this past year was a fruitful one for the DNN community, with the major release of DNN 9. Also, with DNN Corp being acquired by ESW Capital, I'm sure 2018 will be even more productive in this regard. With this in mind, we believe it's about time we increased minimum requirements to DNN 8.0.4 and Evoq 8.5.0 beginning with January 1, 2018. This way we can continue to roll out new features that take advantage of newer DNN capabilities and get rid of some of the old stuff. Overall, our aim is to improve support, security and stability while saving you some headache by keeping your websites up to date in this technologized world. If you are impacted by this launch and you don't have the possibility to update, you can still continue to use our modules, but keep in mind the potential compatibility issues as you won't be able to upgrade to newer module versions or benefit from our free support. Of course, starting with January 2018, we will do our best in offering support on older DNN versions (smaller than 8.0.4) as well but only as part of the Premium Support service. We are here to help! Contact us if you need assistance with upgrading your DNN sites. The journey continues. Are you in?